An indie-esque movie that couldn’t deliver on its promise, Drive follows a skilled getaway driver (Ryan Gosling) who aids and abets criminals. It opens with an excellent sequence—after Gosling escapes a nighttime police chase by driving into a parking garage as it’s emptying, I was hooked. The elevator sequence is also touching. But the rest is too sparse, too boring, too similar to Gosling’s Blue Valentine in its emptiness. At some point, explaining/showing so little just becomes a cop-out, and there are numerous exchanges here where the characters need to actually say or do something instead of just looking at each other. Most movies beat you over the head with their dialogue/theme, but be careful of the other side of that coin; we need something to hold onto. The most obvious room for improvement IMO concerns the lack of debate among the higher-ups with the CEO’s decision. I kept waiting for another twist or turn, for someone to stand up and float a different idea; Spacey disagrees with Irons, but no one seriously considers any other proposals. Thus, you understand where this is going about halfway through, but that’s not a fatal flaw. ‘Be first, be smarter, or cheat,’ Irons says. That’s life, ain’t it? The definition of a ‘perfectly fine’ movie. You can see the mechanism turning and feel the beats coming, but it stays enjoyable throughout. In Time runs with an undoubtedly clever promise, though it would have benefited from having a stronger singular villain. The sequence culminating in Olivia Wilde’s death is gripping and unusual, although I was slightly disappointed to see it recycled for the ending. Timberlake is reliably solid as the masculine action star, although he’s probably more interesting as the refined and slightly effeminate type he does in The Social Network and Friends with Benefits. Sigh. Leo, I know you like to do only Serious And Important movies, and that’s all well and good, but can we go back to doing ones that are also, you know, interesting? Granted, 2010’s Shutter Island and Inception spoiled us, but that doesn’t excuse J. Edgar for a grossly clunky script that never finds clarity or a plot. 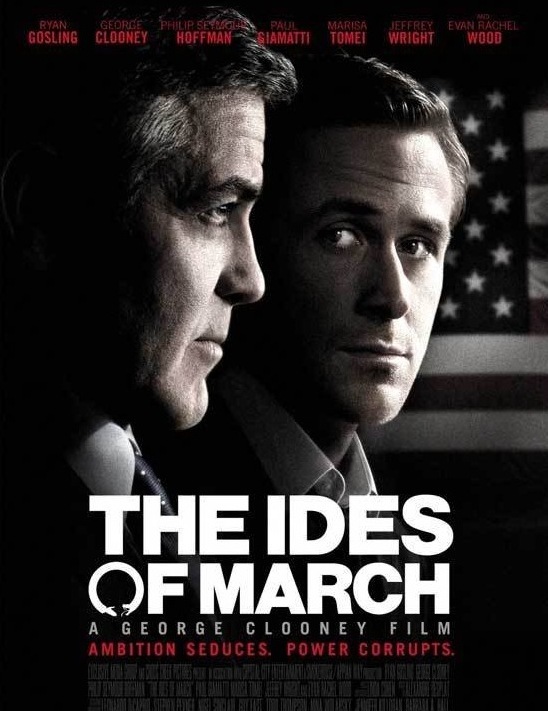 Numerous scenes lack conflict, the narrative is bloodless and insipid, and the framing device of Hoover narrating his biography is possibly the laziest I can remember, just an excuse for ponderous voice-over and exposition. To any aspiring writers: the framing device of Slumdog Millionaire is the way to do it. This is not. This movie also minimizes its lead charater’s complexity and wimps out on saying much negative about him, by attributing so much to his (supposed) repressed homosexuality. Compare with The Social Network: not only does that not wuss out on making Zuckerberg a douche, it also doesn’t provide a pop psychology ‘explanation’ for how he is. In J. Edgar, the actors are good, but stay away. Pop quiz: What do you get when you combine an interesting book that nonetheless felt nothing like a movie, a torturous development process that included a disastrous script draft, and subsequent work by quite possibly the two best screenwriters alive? The result, amazingly, is a pretty darn good Moneyball movie. Moneyball almost never happened. Sony halted the project and fired writer-director Steven Soderbergh after reading where he wanted to go with it, and thank God; I know the man’s had success, but I’m sorry, his draft (you can find it online if you look hard enough) reads more like the output of an inexperienced 18 year-old screenwriter. Take, for example, the introduction of Billy Beane (Brad Pitt) to Peter Brand (Jonah Hill); in the finished film, this comes after the latter has just affected the course of a trade Billy wanted to make with the Cleveland Indians. That adds context and conflict to the one-on-one meeting. In Soderbergh’s draft, the very first scene has those two expositioning—I mean, talking—to each other in the most soporific way possible, with such humdinger lines of dialogue as “We’re getting close to a new stadium.” – “Which you need.” – “Which we definitely need. So let me ask you: Can you work spreadsheets and all that stuff, like Excel?” That’s so bad, I don’t even know what to say. Thankfully, the final credited writers (Aaron Sorkin, Steve Zaillian) boast a joint catalogue that includes Schlinder’s List, A Few Good Men, The American President, Searching for Bobby Fischer, The Social Network, A Civil Action, “The West Wing,” Awakenings, and many other successes. Though by all accounts Sorkin and Zaillian worked mostly independently of each other, they were able to cobble together a cohesive and often moving story out of this mess. Note how they impart more in a couple heartbeats than Soderbergh did in entire scenes. Nothing in his script conveyed the sabermetric philosophy as efficiently as “Your goal shouldn’t be to buy players; your goal should be to buy wins, and to buy wins, you need to buy runs.” In Soderbergh’s script, when catcher Scott Hatteberg wonders about the fans’ reaction to him playing first base, Beane replies with “The fans run my ballclub?” In the finished product, the reply is “Yeah, maybe we can try one of them out too.” Less amateurish, more revealing, and funnier. Brand’s first scene in the boardroom full of scouts is a masterclass of writing for multiple viewpoints, and Moneyball also succeeds in humanizing Beane’s character, largely through the effective subplot with his daughter (almost entirely absent in Soderbergh’s draft). The last post-script is perfect, several lines are laugh-out-loud funny, and you feel something when Beane declares that their work will be discredited if the A’s don’t win it all. The movie is warmer than you’d expect. Yet…it’s tantalizingly frustrating too. After a few viewings, the disjointed way that this script came together becomes evident. The beginning and ending both drag, and the whole thing wouldn’t have lost much at 15 minutes shorter. A few scenes don’t begin as late as they should or end as early as they should, and others (like Beane’s early meeting with the Cleveland brass) feel off. There’s no Sorkin-esque rapid-fire dialogue, and that’s fine in and of itself, but the tone needs a few jolts of intensity. But ultimately, I can’t be too harsh, because adapting that book would have been extraordinarily difficult. The writers, and actors, did a solid job, and that’s commendable.